Since the bombings a month ago I’ve become used to seeing lots of Police every day on my morning commute through Waterloo station. Today I was walking along the concourse at Waterloo (staring down at my feet in my usual half-awake manner) when I looked up and saw two huge coppers in body armour with semi-automatic rifles. As I looked closer I could see their trigger fingers were already crooked into position and poised about an inch from the trigger itself. 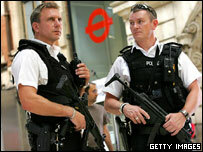 They looked a lot like these two fellas (it may well be them; that is Waterloo station). Then I realised I was staring so looked away (funny how everything you think of doing seems suspicious in such circumstances). At this points you realise that running, or playing with your bag would be a “bad thing” to do. Of course I walked right past them and nothing happened. After walking over Waterloo Bridge and into Covent Garden I walked past Bow Street Magistrates Court. Loads of Police; TV cameras; even a guy on a step ladder with a lens about three foot long. This happens from time to time when there’s a big case on so I thought nothing of it. Then when I got to work and mentioned it to a colleague he told me that the first trial of the “bomber” was on there today. Link to the trial going on today. Not a bomber as such, but the first person to be charged with anything relating to the bombings.